Any outsiders aware of SBB’s mission and impact probably came to it through the documentary Shakespeare Behind Bars, which premiered at the 2005 Sundance Film Festival to wide acclaim. In it, the SBB ensemble at Luther Luckett rehearsed and staged The Tempest, Shakespeare’s story of betrayal, forgiveness, isolation, and freedom. The film shows founder Curt Tofteland living out his vision to bring humanity and hope to a population of prisoners in long-term lockup. And it’s where Big G—a physically imposing man at 6-foot-5 and 330 pounds, with bravado to spare—portrays Caliban, Prospero’s rebellious slave, and confesses his fears about being a man in prison serving out a 65-year sentence for robbery and murder. Tofteland, a professional director and Equity actor who spent 20 years as Producing Artistic Director of Kentucky Shakespeare Festival, established Shakespeare Behind Bars to expand an existing prison educational program called Books Behind Bars, founded by Bellarmine University. The not-for-profit program is funded entirely through donations and operates at the discretion of prison leadership. 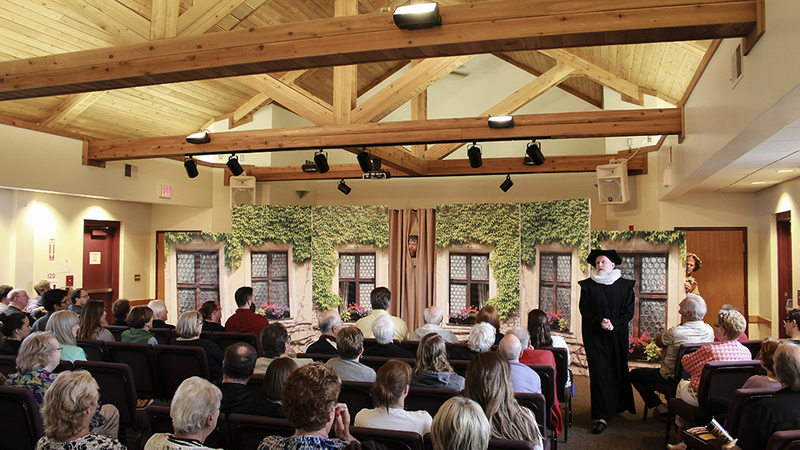 In 1995, Tofteland brought his Shakespeare-specific program to Luther Luckett, where he served as the main facilitator until retiring in 2008. But why Shakespeare? Refer back to the source material: Prison is as ripe a setting for Shakespearean themes as any. And there’s a lot about Shakespeare that makes him an ideal literary linchpin for this program. The sheer scale of his work provides endless thematic entry points for any theater company to explore, particularly one engaged in a therapeutic social project. Shakespeare’s plays are little literary bio-domes with their own ecosystems; prison is a cloistered place with its own norms and power structures. It’s a place of extremes, and Shakespeare’s work places humanity’s extremes—life and death—at center stage. These themes are appropriately weighty, too. “Shakespeare is the only writer I know that addresses every trauma that every human being has ever suffered in any epoch, past or present,” says Tofteland. The men of SBB literally act out rage, love, shame, euphoria, madness, pride, and fear, sometimes all in one play. These are essential human experiences, and to explore them in a creative setting is to get at them in a controlled way. It’s a test environment for emotion: An inmate can experience the full extent of a violent sentiment without the risk of actually harming someone. It’s a safe way to learn about his own humanity, which is something any violent offender sorely needs to do, for his own sake and the sake of those around him. 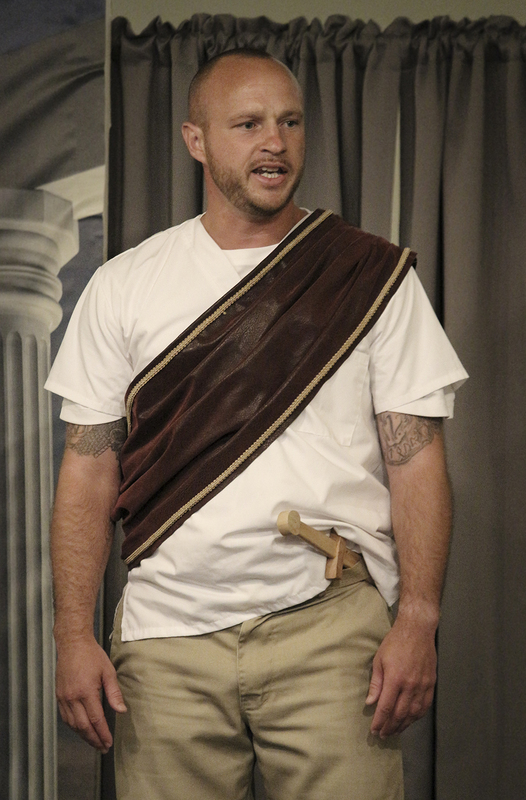 In May of last year, my two sisters and I drove the 90 minutes from Cincinnati to La Grange, Kentucky, to watch Luther Luckett’s SBB cast perform Julius Caesar. The audience was a sympathetic one, comprised mostly of inmates’ friends and family members as well as a few random drop-ins like us. Despite the slightly intimidating setting, the tone of the night was largely festive, even celebratory—almost like a graduation. Many in the audience seemed pleasantly surprised at this show of positive creative energy from the men who’d brought them there. There was a kind of sweet optimism, too: In the question-and-answer session that followed the performance, one woman called out that “parole boards should see these shows” before making decisions about a cast member’s release. SBB’s public shows take place in the prison’s small chapel, built by inmates years ago. The sets and costumes are spare but sufficiently evocative. 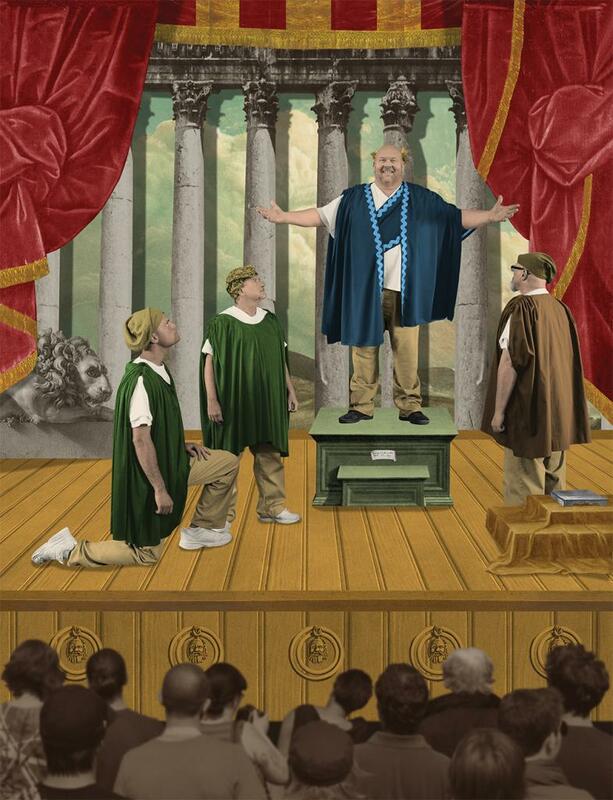 In Caesar, for example, a drop cloth with a painted colonnade served as the background. The men wore colored sashes or tunics over prison-issue khakis and white sneakers, tattoos peeking out beneath white T-shirts. 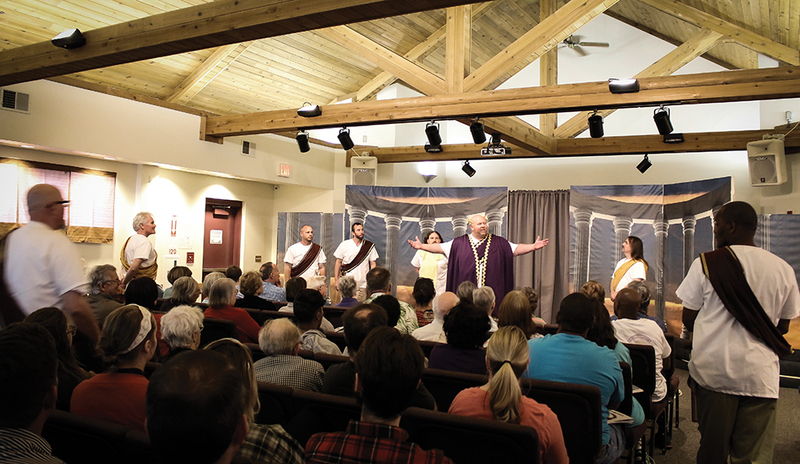 Caesar (played by Big G) wore a purple and gold-trimmed cloak and a gold wreath crown. The assassins carried wooden daggers. After the deed was done, Caesar’s cloak showed red slashes, and the men stood in a circle with their hands up, wearing red gloves. The irony—or whatever it was—of the play choice wasn’t lost on anyone in my group. 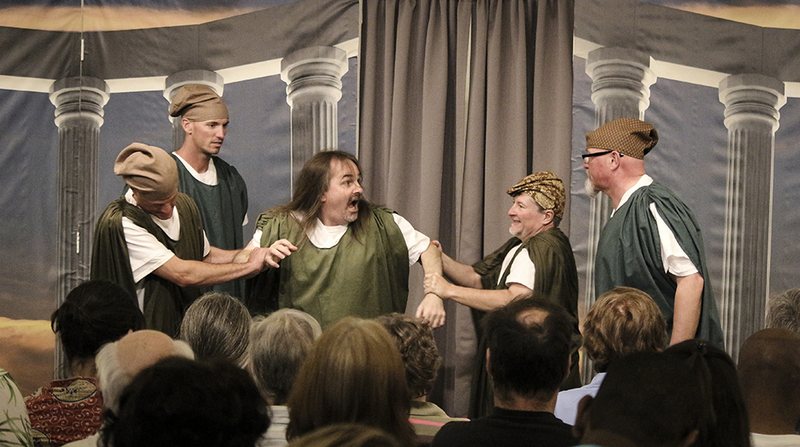 Violent criminals acting out one of Shakespeare’s most murderous tragedies? Yikes. The title character is stabbed 23 times, after all. We could only muster nervous laughter. But the awkwardness didn’t last long before a kind of theater magic took hold, especially once the characters began their work exploring the play’s themes of ambition, camaraderie, and fate. It wasn’t hard to imagine the men rehearsing this scene, each cast member considering his own past, present, and future. For the performance, the audience was right there with them, thinking about decisions and destinies—how we make choices that ripple across our lives, and how our existence often seems to play out before us without our control. It was one of those rare moments in public performance where the whole room seemed momentarily on the same page. 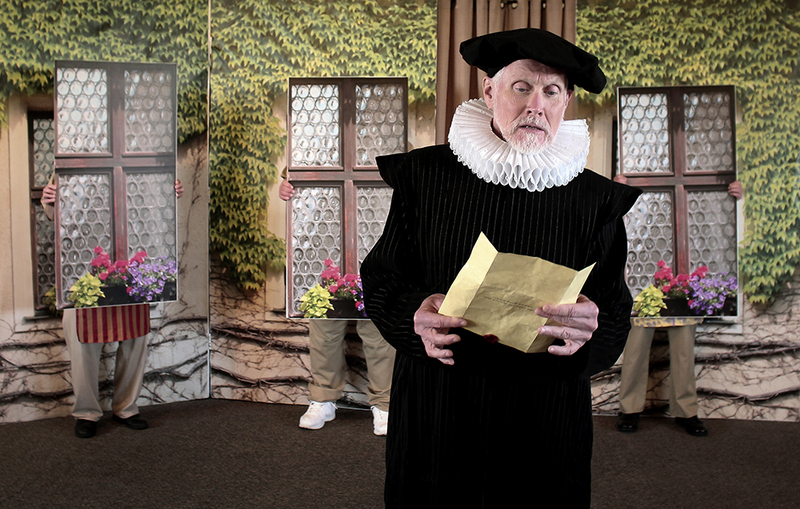 Shakespeare Behind Bars isn’t only about the elevating power of the arts. It’s about basic life skills: conflict resolution, anger management, personal accountability. If the touchy-feely stuff doesn’t move you, consider the cold reality of recidivism. These skills are necessary for a prisoner’s successful reintegration back into society. Without them, parolees and fully released prisoners are more likely to re-offend and return to prison—more likely to hurt more people and end up back where they started. Inmates don’t get “good behavior” credit for participating in SBB either; it’s on them to show up, do the work, and be a dependable part of the team for their fellow castmates. SBB injects a kind of mutual accountability into the lives of many inmates who have never experienced it before. And the ties go deeper still for long-standing cast members like Hal Cobb, serving a life sentence for murder. Cobb has been with SBB since the very first year at Luther Luckett. “This group has been my lifeblood,” he says. “Because of my crime, I’m estranged from much of my family. This is my family. It gives me purpose.” He looks forward each year to the rehearsal process, which begins in the fall and continues through the springtime performances. They offer a break from the monotony of prison life, but also a shot of intellectual exercise and camaraderie. “This is my winter solstice,” he says. Thinking about these violent offenders enjoying artistic fulfillment—or even therapeutic success—does require some suspension of judgment. For many active and law-abiding members of society, the thought of these prisoners living at all can be outrageous. They aren’t merely downtrodden men from rotten circumstances, though it’s important to remember that most of them are also that. As children, many were victims of physical, sexual, and emotional abuse and neglect; as men, many are abusers themselves. But their crimes can’t be wiped away with good intentions and changed hearts. Most are heinous: An execution-style gunshot to the head. A butcher knife to the throat. A hair dryer in a bathtub. And almost all against women—women they knew, women who thought they knew them. Discovering these things, even after I attended the performance last spring, was scary. It isn’t mortal fear, exactly, but an existential dread that comes with being a woman in a world of men and a mother to a young girl. It’s the kind of disquiet that makes you inventory the sorts of men in your own life. To follow the progress of Shakespeare Behind Bars is to live in a forced state of ambivalence. After all, the victims can’t speak. These men left chasms of grief in their paths. I can’t say with confidence that if I were personally affected by violent crime I’d be willing or able to champion these prisoners’ happiness. And yet I can’t ignore their humanity. To deny them that would chip away at my hopes for my own goodness. Vengeance and virtue are mutually exclusive. If any part of you believes that true redemption is possible—that people are not lost to us when they commit monstrous acts—then Shakespeare Behind Bars should lift your soul. 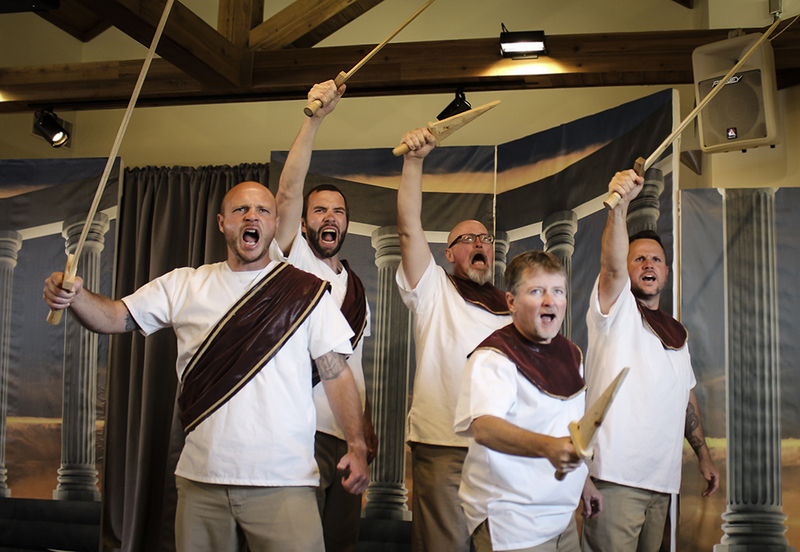 After witnessing the final product of Julius Caesar last May, I visited an early rehearsal session for the 2018 performance in late October. The rehearsal space is a borrowed classroom inside the prison gate, where the perimeter fences are wrapped with bundles of barbed wire and an armed guard tower has a 360-degree view of the yard, the buildings, and the fields beyond. Luther Luckett is a medium-security facility, but it’s still a prison, and the circle of men seated inside feels out of place. They are calm, friendly, and ready to work. Each holds a paperback copy of A Midsummer Night’s Dream, some right up to their noses, scanning pages as they shift their weight on plastic chairs. I recognize a handful from last May’s performance. Their uniforms blend into a tan row, but their faces peer out, each man there for his own reasons, with his own past, and with his own immediate goal: to learn his part. They will give seven performances of A Midsummer Night’s Dream May 1–10, 2018, three for other inmates and four for the public. On the day of my rehearsal visit, Wallace was accompanied by co-faciliator Keith McGill. Wallace presides over the group while McGill works with the men individually until each knows his lines inside-out—Wallace the doting mentor to McGill’s wry observer. They’re both kind, quick to smile, and clearly appreciative of the company they’ve found themselves in. McGill frequently stands up to meet the men where they are, literally, and walk them through a scene before they can become overwhelmed or discouraged. They’re both pros, too, recognizing strengths and weaknesses well before the men do and guiding them to realize their own potential. “I love to watch them get out of their own heads,” Wallace says after working with one cast member who finally gained control over a difficult scene. Wallace and McGill set the tone for the group, but before long, the men begin to lead themselves, taking the posture of scholars wading into deep ideas. They have collected decades of instruction from Tofteland and crew, and they pass it down to each other like a kind of oral history. Their feedback for each other is thoughtful, sympathetic, and well-informed—I learned a good deal about the work of acting during my brief visit. The rehearsal circle is one part study group, one part therapy session, one part pseudo-AA meeting. 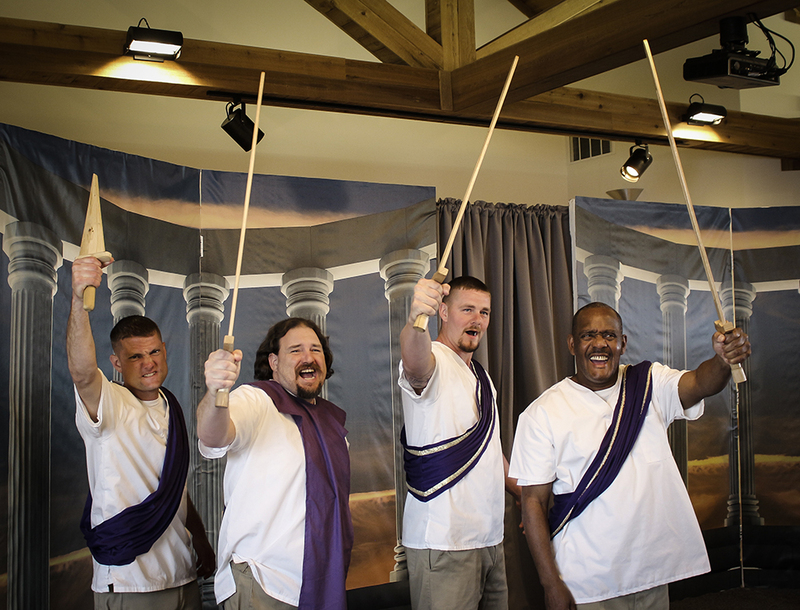 Even more than the performance itself, rehearsal is the locus of the Shakespeare Behind Bars program. The men are almost required to take stock of their own behavior and responsibilities through the filter of learning a part. The play’s the thing, as it were, but in terms of personal impact on the participants it’s more of a happy by-product. “Every day the work of the circle is to fix themselves,” explains Tofteland. The unusual casting process for SBB is a good example of this approach. Unlike traditional productions, the director doesn’t hand down a casting decision based on auditions or seniority. Rather, the men themselves read the play, think about what role they’d like to take, and pitch it to the group. There’s discussion, give-and-take, lots of cooperation, and ultimately a cast is formed. It’s the kind of thing that’s unheard of in the conventional theater community: the idea of actors humbling themselves to each other’s opinions and feedback rather than deferring to a single authority figure. And it’s no place for ego. But year after year, the men revel in it and seem to value opportunities to challenge themselves and change up their own perspectives. Charles Young experienced a version of this tension in the time between his role as a conspirator in Julius Caesar and his latest role as Hippolyta in Midsummer. The intervening months had been difficult for Young and his family on the outside in the lead-up to his 2019 parole board hearing. He’d even considered taking a hiatus from Shakespeare Behind Bars; the stress had sapped his resolve and distracted him from the program. Before the day’s rehearsal on Midsummer began, Young asked to address the cast and started with an apology. “I’m sorry for missing practices,” he said. They nodded along. “I don’t want to disappoint anyone, and I need to be a man of my word.” The men then thanked him for speaking and began their work. Ticket Information: Reservation requests will be available April 1 at shakespearebehindbars.org; seating is limited. All audience members must be cleared by the Department of Corrections through a secure online form. Contact SBB Director/Facilitator Matt Wallace at matt@kyshakespeare.com with questions.